Slow Poke the possum had quite the summer in 1970; he won a beauty contest, made headlines, and was pardoned from becoming Governor Bob Scott’s next meal. We know possums as gray, rat-like creatures that only come out in the dead of night. Trivia buffs know that the possum has been the official state marsupial of North Carolina since 2013 (although they were uncontested, as they are the only marsupials in North America) and that its natural predators are birds of prey, foxes, and speeding cars. And in 1970, one possum in particular created quite a ruckus in Raleigh. At the second annual National Hollerin’ Contest in Spivey’s Corner, a “Prettiest Possum” pageant was added to the day of activities. 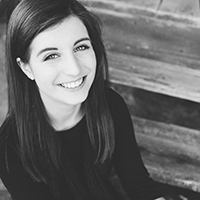 While competitors let out their best yells and yodels, a possum named Slow Poke was curled up in his cage, scared of the weird noises and the unfamiliarity of the area. L.E. Baker of Dunn had captured him a few weeks earlier as he scampered across the highway in Harnett County. 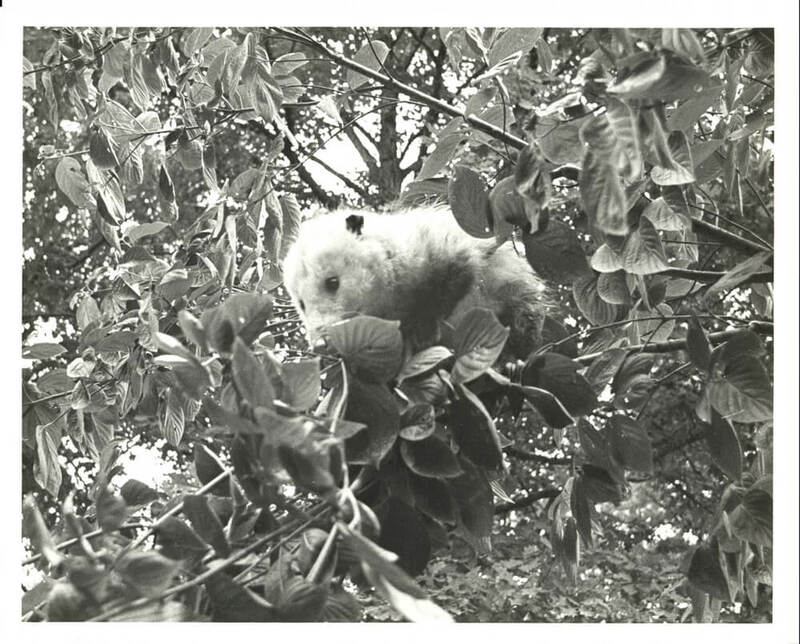 Slow Poke won the title of “Prettiest Possum” that day, perhaps because of his white coat (an abnormality among possums), or because of his gigantic size (nearly three feet in length, with 14 inches of tail alone). Slow Poke was awarded a trip to New York to tape a television show, alongside Hollerin’ Contest winner H.H. Oliver. He was also to be presented to Governor Bob Scott — which is where our possum’s story takes a turn for the worse. That’s because Governor Scott was known to indulge in possum meat on occasion. Slow Poke, Oliver, and “Possum Queen” Margaret Anne Wilkes (crowned at the National Hollerin’ Contest) were introduced to Governor Scott in his executive office. Slow Poke had been given a bath, and even had his nails painted for the occasion. Wilkes agreed, with some trepidation — it would be hard to turn down any offer for dinner with the governor, even if he was asking you to eat something as unusual as possum. It was decided: The governor would host a banquet at the Executive Mansion, and poor Slow Poke was to be the main course! For weeks, letters came pouring in to the News & Observer (the main source of reporting on Slow Poke’s life after fame) protesting the proposed possum banquet. Women were allegedly the main source of complaints, although Floyd Brown, chief pilot for the State Department of Conservation and Development, also had his reservations about Slow Poke’s fate. The next day, journalist Charles Craven announced that there was a possibility Slow Poke would receive executive clemency. He had, after all, won such a glamorous title as “Prettiest Possum,” and had been groomed and pampered even more than the average pet. 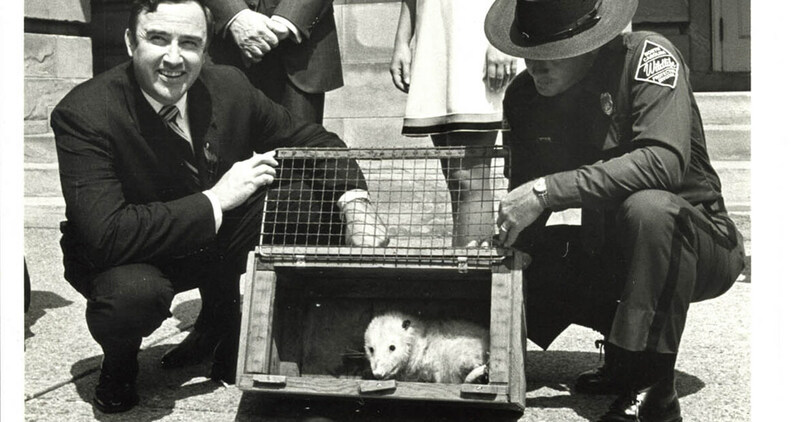 Under public pressure, on July 31, 1970, in a ceremony held in Capitol Square, Governor Scott pardoned Slow Poke the possum. Joining him was Margaret Ann Wilkes — the Possum Queen that had never eaten possum — as well as the Secretary of State, Commissioner of Agriculture, and the State Parks Director. Slow Poke was sent to live the rest of his life in Raven Rock State Park in Harnett County, the same county he had lived in before that one fateful summer. As for Governor Scott, he claimed that day that he would “not be thwarted in [his] appetite for possum.” And he wasn’t. Two years later, he served cooked possum at the Executive Mansion during a black tie affair. While there is no word of another pardoned possum in the United States, or even another “Prettiest Possum” competition at Spivey’s Corner Hollerin’ Contest, the legend of Slow Poke is surely passed down from possum generation to generation, if not simply immortalized in local North Carolina newspapers from the summer of 1970.